The next chapter in Meghan Markle's fairy tale has begun. 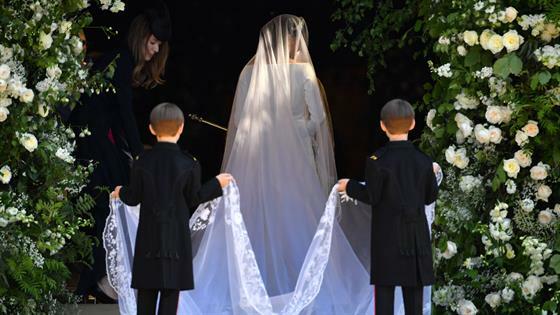 Wearing a Clare Waight Keller for Givenchy dress, Meghan married Prince Harry today in an unforgettable (and star-studded) ceremony. The couple recited their vows at St. George's Chapel at Windsor Castle; since 1863, the 14th century chapel has hosted 16 royal weddings. About 45 minutes before the wedding, Meghan and her mother, Doria Ragland, left Cliveden House and began their 20-minute drive to the chapel. They were chauffeured in a Rolls-Royce Phantom IV that was built and delivered in 1950; it was Queen Elizabeth II and Prince Philip's first Rolls-Royce—made when she was still Princess Elizabeth—and is one of only 16 ever built. Meghan wore Queen Mary's diamond bandeau tiara, on loan from Queen Elizabeth II. Harry, who decided not to shave his beard, arrived wearing the Blues and Royals frockcoat uniform—with his grandmother's permission. It was tailored at Dege & Skinner on Savile Row. Hours before the wedding, Queen Elizabeth II bestowed royal titles on the couple. According to Buckingham Palace, Harry is now the Duke of Sussex, Earl of Dumbarton and Baron Kilkeel, while Meghan became Her Royal Highness The Duchess of Sussex after the ceremony ended. Harry and Meghan invited 2,640 members of the public onto the grounds of Windsor Castle to watch the arrivals: 1,200 members of the public from all parts of the United Kingdom; 200 people from charities connected to the couple; 100 students from local schools; 610 Windsor Castle community members; and 530 members of the Royal Households and the Crown Estate. Patrick J. Adams, Princess Anne, Princess Beatrice, David Beckham, Victoria Beckham, Troian Bellisario, James Blunt, Cressida Bonas, Priyanka Chopra, Amal Clooney, George Clooney, Chelsy Davy, Princess Eugenie, Sarah Ferguson, Janina Gavankar, Tom Hardy, Gabriel Macht, Kate Middleton, Pippa Middleton, Misha Nonoo, Prince Philip, Abigail Spencer, Gina Torres, Serena Williams and Oprah Winfrey were among the guests. Harry's brother, Prince William, served as his best man, while Meghan did not select a maid of honor. "She has a very close-knit circle of friends and she didn't want to choose one over another. All have been actively involved in helping her prepare for the day and will be there in the days beforehand," a spokesman said last month. "She's very happy to have their support." The bridal party was announced Wednesday. Princess Charlotte, 3, Florence van Cutsem, 3 Remi Litt, 6, Rylan Litt, 7, Ivy Mulroney, 4, and Zalie Warren, 2, served as bridesmaids, while Prince George, 4, Jasper Dyer, 6, Brian Mulroney, 7, and John Mulroney, 7, were all page boys. The American bishop opened his speech with the words of civil rights leader Martin Luther King, Jr., who said: "We must discover the power of love, the redemptive power of love. And when we do that, we will be able to make of this old world a new world. Love is the only way." "There's power in love. Don't underestimate it. Don't even over-sentimentalize," he told the wedding congregation. "There is power in love. Love can help and heal when nothing else can. There's power in love to lift up and liberate when nothing else will." That power could be seen throughout the service, he said, adding, "Two young people fell in love and we all showed up." Karen Gibson and a gospel choir then sang a cover of Ben E. King's "Stand by Me." Members of Princess Diana's family were in attendance, and Lady Jane Fellowes gave a reading. Kensington Palace previously said Harry and Meghan "feel honored" that she is representing her family and celebrating "the memory of the late Princess on the wedding day." After reciting their vows, the couple exchanged gold rings. Six days before the wedding, The Mail on Sunday discovered Meghan's father, Thomas Markle, had staged photo shoots with the paparazzi in the months leading up to the wedding. He later expressed regret for his participation and insisted he profited little from the sale of the photos. Meghan's estranged half-sister, Samantha Grant, said she had encouraged their father's set-up. Thomas, who had been confirmed to walk Meghan down the aisle, told TMZ Monday he had recently suffered a heart attack and would no longer be able to travel from Mexico to the U.K. and participate in his daughter's big day. "This is a deeply personal moment for Ms. Markle in the days before her wedding," a palace spokesperson told E! News. "She and Prince Harry ask again for understanding and for respect to be extended to Mr. Markle in this difficult situation." On Thursday, Meghan provided an update on her father's health and clarified his involvement in the ceremony. "Sadly, my father will not be attending our wedding. I have always cared for my father and hope he can be given the space he needs to focus on his health," she told the public, adding, "I would like to thank everyone who has offered generous messages of support." Meghan had asked Harry's father, Prince Charles, to walk her down the aisle of the Quire. There ceremony ended with "God Save the Queen," then Harry and Meghan left the chapel. The newlyweds had their first public kiss on the steps, set to the song "This Little Light of Mine." Alexi Lubomirski, who shot the couple's engagement portraits, is doing the formal wedding portraits (to be released next week). Meanwhile, florist Philippa Craddock and baker Claire Ptak each worked around the clock to ensure everything looked, smelled and tasted perfect. Following the carriage procession, 600 guests will attend the first wedding reception at St. George's Hall; the newlyweds will join their family and friends once the ride is over. Later that evening, Charles will host a more intimate reception for 200 invited guests at Frogmore House. The royal couple's love story has been well documented, but it actually began in secret. In November 2016, Harry issued a statement defending Meghan from "sexism and racism" on social media—and, in doing so, confirmed that he was, in fact, involved with the American actress. He proposed a year later, on what later he described in an interview with the BBC as a "standard, typical night" at their cottage. In fact, Meghan was roasting a chicken when he got on one knee to propose. "She didn't even let me finish. She said, 'Can I say yes? Can I say yes?'" Harry said. "I was like, 'Can I give you the ring? She goes, 'Oh, yes! The ring!' It was a really nice moment; it was just the two of us." Meghan lovingly described the proposal as "very romantic." Introduced through a mutual friend, they met for their first "blind date" in July 2016. "Because I'm from the States, you don't grow up with the same understanding of the royal family," Meghan said in her BBC interview. "While I now understand very clearly there is a global interest there, I didn't know much about him. So, the only thing that I had asked her when she said she wanted to set us up was...I had one question. I said, 'Well, is he nice?' Because if he wasn't kind, then it didn't seem like it would make sense. So ,we went and met for a drink then, I think, very quickly into that, we said, 'What are we doing tomorrow? We should meet again.'" Harry said he'd "never heard" of Meghan prior to their date, either. "I was beautifully surprised when I walked into that room and saw her—and there she was, sitting there," he marveled. "I thought, 'I'm going to have to up my game here, sit down and make sure I've got a good chat.'" Because of their busy schedules, Harry suggested Meghan join him on safari in Africa for another date. "It was hugely refreshing to be able to get to know someone who isn't necessarily within your circle, [who] doesn't know much about me [and] I don't know much about her. To be able to start almost fresh right from the beginning in getting to know each other step by step, and then taking that huge leap of only two dates and then going effectively on holiday together in the middle of nowhere and sharing a tent together and all that kind of stuff. It was fantastic," the prince recalled. "It was absolutely amazing to get to know her as quickly as I did." To protect their privacy, Harry said, "We had to sort of reverse the whole [dating] process." Often, the couple would spend "cozy nights in in front of the television," eating meals in their cottage, "rather than going out for dinner and being seen in public." The experience "provided different opportunities," Harry said. "It made us a hell of a lot closer in a shorter space of time." The couple had been together for a little over a year and a half before Harry popped the question. Meghan wouldn't call it a "whirlwind" romance, despite how it may have appeared, considering they had "a good five, six months" of privacy. And while she was finishing her run on USA Network's Suits, she said, "We never went longer than two weeks without seeing each other, even though we were obviously doing a long-distance relationship. So, we made it work." Meghan added, "Very early on, when we realized we were going to commit to each other, we knew we had to invest the time, the energy and whatever [else] it took to make that happen." Once the media became aware of their relationship, everything changed. "I did not have any understanding of just what it would be like," Meghan admitted. "I don't think either of us did." "I think both of us were totally surprised by the reaction after the first five, six months we had to ourselves," Harry explained. "You can have as many conversations as you want and try to prepare as much as possible—but we were totally unprepared for what happened after that." Said Meghan, "There is a misconception that because I have worked in the entertainment industry that this would be something I would be familiar with. But even though I had been on my show for six years at that point, and working before that, I have never been part of tabloid culture. I have never been in pop culture to that degree and I lived relatively quiet life." To cope, she decided to avoid reading anything, positive or negative. "It just didn't make sense." Instead, Meghan said, she and Harry "focused all of our energies on nurturing our relationship." Meghan's days as an actress are behind her, and in her new role, she will focus on charitable endeavors. "I don't see it as giving anything up," she assured the BBC. "I just see it as a change." The joint interview with the BBC, conducted just hours after the couple announced their engagement, marked the first time either of them had spoken at length about their romance. "We're a couple. We're in love. I'm sure there will be a time when we will have to come forward and present ourselves and have stories to tell, but I hope what people will understand is that this is our time. This is for us. It's part of what makes it so special, that it's just ours," Meghan said two months earlier in Vanity Fair. "But we're happy. Personally, I love a great love story."